Since moving to New York from California one of the hardest to find food items for us has been cane sugar colas. When we saw Virgil’s in a local grocery store we were thrilled! 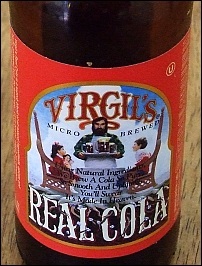 We love Virgil’s Root Beer with it’s unique spices and figured their cola would be equally distinct. Well, it was distinct, there’s no doubt about that, but I’m sorry to say that I didn’t like it at all. The first sip seemed mediciney at first and after a while I realized that it reminded me of carbonated Listerene. It’s either the clove bud oil or the cassia oil (or both) that coat your tongue when you drink it, slightly numbing it and drowning out the other flavors. There are also lemon, orange and lime juice extracts which you can barely taste but when it does come through it hits like orange juice right after you brushed your teeth. Bleh. We’ve actually found one brand of cola that has “cola nut flavor” in the ingredients, but that’s the subject of another post.